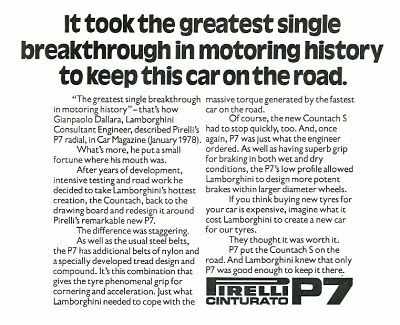 When the incredibly low profile, high performance 285/40 YR 15 PIRELLI CINTURATO ™ P7 came out in the 1970's, it rocked the world with the performance that could be expected from a tyre. The good news is PIRELLI have produced the 285/40VR15 CINTURATO ™ P7 tyre again, a critical original equipment tyre for the front of the later wide body De Tomaso Pantera which also fitted 345/35VR15 P7 tyres on the rear. These tyres are also a perfect road going option for the rear of the Porsche 911 RS cars of the 1970's which are fitted with wide rear wheels. It is also worth pointing out that because the tyres were originally named 285/40VR15 P7 they are actually homologated as a 285/40 R15 92Y, as they do actually qualify for the higher Y speed rating. This detail is written on the side wall in less conspicuous smaller writing to keep the tyres looking as they did back in the day. The Overall Diameter of the 285/40 YR 15 PIRELLI CINTURATO ™ P7 is mm and the width is mm.